Why is a universal translator so elusive? With a global economy and flights that can take you all over the world in hours, why is it that we still struggle with a language barrier that technology is finding hard to break down? Turn on a TV in a Tokyo hotel room and you will get, if you do not speak the language, a jumble of incomprehensible symbols. And from the moment you touch down in Japan, chances are you will be faced with a world that is difficult to decode. Some of the world's most untranslatable words are Japanese. For instance, the word "naa", used in the Kansai area of Japan to emphasise statements or agree with someone, is placed third in a list of the most difficult words to translate - so what can be done when confronted by information that you are unable to process? Translators are expensive and while useful in getting out of sticky situations, they are often out of the reach of the regular tourist. So a gadget that was the perfect translation tool would be ideal. If only it were that simple. Science fiction has always circumnavigated the problem of language with clever devices which act as universal translators - Doctor Who's Tardis, the Babel fish in the Hitchhiker's Guide to the Galaxy - but in reality it has been a lot trickier. There is already a clutch of reading aids on the web - most notably, and now in over 50 languages, Google Translate. For access to websites beyond your mother tongue, just enter the web page address and the tool does all the hard work. The problem is that, so far, it is quite literal with its translations and lacks the nuance of someone who speaks the language. 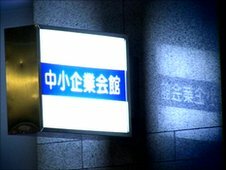 Google itself says "while we are working on the problem, it may be some time before anyone can offer human quality translations". Another site called dotSUB lets members add their own subtitles or translations to videos - think YouTube meets Wikipedia - and the free version allows people to translate through 400 languages, though there is no formal quality control. Japanese is particularly challenging as there are three different types of writing. One alphabet is especially for foreign words and if that was not complicated enough there are also over 50,000 symbols - Kanji - which are actually pictures of whole words. You need about 2,000 of them to get through daily life in Japan. An iPhone app called WishoTouch lets you enter Kanji by hand then gives you a dictionary definition. 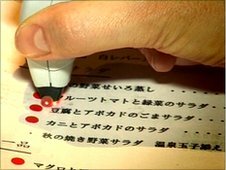 But you will need to know the stroke order - although the add-on lets you photograph your mystery Kanji, one character at a time. So faced with the thought of dinner, and a whole load of symbols in a row, you are going to wish for a quicker and less painful way to help you find out what is on the menu. One translation tool that deals with written text is called a Quicktionary and it is a character reader. It looks similar to a pen and when swiped across text it will give you a translation. At least, that is the idea. This device is impressive but only works with two typefaces - a problem shared by most text readers. And perhaps the most comprehensive gadget on a market is a 126-language cross translator made by Ectaco. "It all started 20 years ago with the Russian market," says Greg Stetson, product manager of Ectaco. "In Russia there were a lot of immigrants coming into America and [our product] started off as a Russian electronic dictionary - after that it evolved from electronic dictionaries to more language learning products - and from Russian it had to expand into different languages." Even soldiers in Afghanistan and Iraq have used mobile translation when talking to local people. 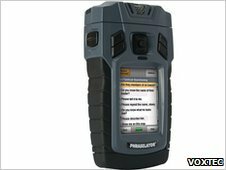 Voxtec's Phraselator has been the choice of the US military for years but, with a price tag of thousands of dollars, this is unlikely to transfer into success in the mass market. Even if a machine can eventually translate speech in real time across hundreds of languages, it would still need some artificial intelligence to work out what people are actually implying - as everyone knows, no matter what country we are in, we do not always say what we mean. "The Japanese prefer to speak in a roundabout way," says linguist Takafumi Shimizu, of Sophia University Tokyo. "So if a taxi driver said to you it's difficult to get there in 10 minutes, he actually means it's impossible. Likewise when Japanese people want to refuse a request or invitation, they would say I'll think about it but do not expect a preferable answer later because the actual meaning is 'I'm refusing'." And even if you get the right words, you might get them in the wrong order - luckily if you're speaking to Professor Shimizu, he will probably understand you anyway. "In English, the basic word order is subject, verb, object," he says. "In Japanese the best word order is subject, object and then verb. So for example 'I bought tea leaves at Harrods yesterday' would be, in Japanese, 'yesterday Harrods at I tea leaves bought'." In Star Trek, their universal translation device was not invented until the latter half of the 22nd Century and even then it was not flawless. Let's just hope we do not have to wait that long for something similar in real life.